Be inspired – get ideas and suggestions for a meal like nothing you’ve had before. Until now Garlic Wood has been sustainable catering’s best kept secret. Toby has never done any advertising, yet he looks after six or seven events a week for the whole summer, often booking months or even years ahead. So how can you get Toby to come and cook for you? Get in touch using the contact form to let us know the dates and nature of your event. If we can help then we’ll sent up a meeting with Toby to talk ideas. Toby is excited by a challenging brief. The opportunity to research, experiment and create makes him very happy. He likes to cook multi-course, multi-option Sharing Feasts. Using only local, sustainable and ethically produced ingredients, Toby creates food you can enjoy with all of your heart. The knowledge that the environmental and cultural impact of your feast will be minimal if not positive means that you and your guests can feel positive about taking the trouble to consume responsibly. This food is as traditional and rustic as it gets, cooked and presented in ways you have never seen before. Food is an activity, not an object. A meal is something you enjoy, not something you own. To eat well is to experience with all of your senses and remember those sensations afterwards. Food brings life, in more than one way. We want you to eat well, and we want you to feel good about it. Conscious consumers of top quality high-welfare food look for hyper-local, sustainable produce with an ethical and responsibly managed provenance. We will move heaven and earth to serve you the meal you want without creating unintended harmful impacts. Food is important. But is is only one part of a meal. The setting, the atmosphere, the reason for gathering, the people you dine with and the people who serve your food are all exciting, pleasurable elements that make up the meal experience. Toby loves ingredients, loves to cook, loves to work hard and make good food. From May to September each year, Toby spends 90% of his time with his hands in food. In the winter, he invests in menu development, research, trying new ideas, meeting with suppliers, running tasting sessions and experimenting with recipes. This is not work to Toby, it’s his life. He doesn’t do it to get rich. He just loves working with passion and creativity to innovate and develop excellent food from sustainable ingredients. He’ll never stop cooking. Knowing where your food comes from is a responsible and conscious way to eat. People choose Garlic Wood because they care about the provenance and sustainability of the food they want to serve their guests. Our ingredients, wherever possible, come from within a few miles of Garlic Wood’s West Sussex kitchens – including wild and foraged food, herbs from Toby’s own garden, nettles from outside the office window, and edible flowers grown for you by a neighbour in the village. Fruit comes from an ancient orchard of Old English varieties – apple, pear, and quince – to which Garlic Wood has the rare privilege of access. All our meat comes from Garlic Wood Ethical Butchers, a sister organisation whose dedication to tradition, quality and sustainability helps them provide meat from pasture-fed, free-range traditional and rare breeds. Because they believe in high-welfare food produced in harmony with the environment, they partner with farms that put ethical production at the heart of thriving rural economies. We can rely on them to provide the best quality ethically sourced meat, all year round. Toby has loved food from his earliest childhood. He’s not a trained chef, but he is a professional. A transformative influence on Toby’s repertoire and ethos was the years he lived with his young family in rural Italy. It was a real ‘Good Life’ set-up: a small farm with animals and a vineyard where Toby and his neighbours were self-sufficient and taught one another traditional techniques and knowledge. The local people have a real connection to their food in a way that we have lost in Britain – they know exactly where their food comes from because they sowed, raised, harvested, picked, foraged and cooked it with their own hands. It is this connection that lies at the heart of Toby’s values. “Rural Italian life is made up of work and food.” Toby explains how this way of life so closely reflects his outlook. His fascination with every part of the journey from the earth to the stomach means that Toby understands food in a very real way. Good food is made of hard graft, traditional techniques, time, effort, care, attention and love. Toby and his wife Michele work together all year round, and you’ll find her delivering Street Food to hungry shoppers and workers in Horsham twice a week. Each summer Toby and Michele are joined by a team of chefs, cooks and other creative professionals who are local people with whom they have worked for years. Even the people who bring the food to your tables are people they know – the family of producers and friends from the village. They are all people who love food – no strangers and no-one from agencies. Our commitment to locally sourced produce even extends to the people. Because our food has so much personality, it’s important to us that the people who make it and put it in your hand have just as much confidence and sparkle. 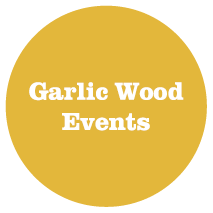 There are no invisible waiters at a Garlic Wood event – our Sharing Feasts are introduced with fun, engagement and enjoyment. 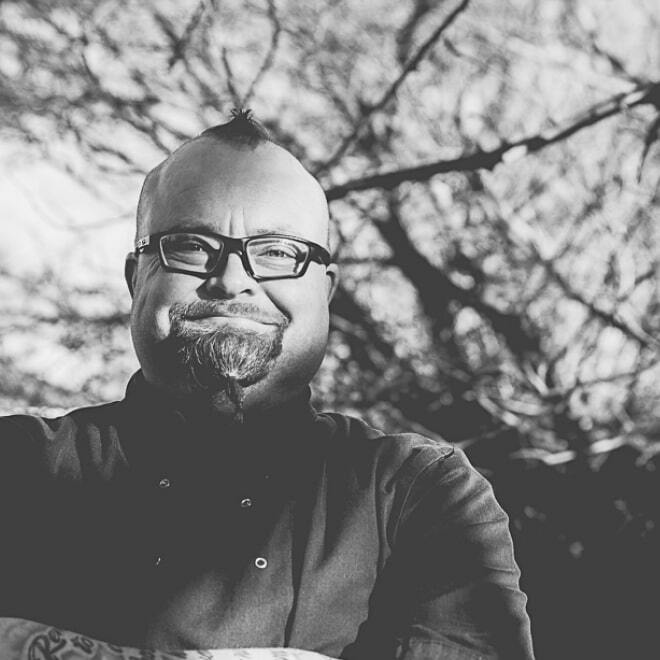 Our people are professional and courteous, but more importantly they are essentially human.